I have a couple trips to the store that I haven’t had a chance to post just because of the holidays. Time sure does fly by! I had over $20 worth of ECBs that I needed to spend that were to expire so I went to CVS and this is what I got. I was hoping to make the deal a money maker or close to free as possible but they were out of the Complete Contact Solution $9.99 Get $9.99 ECB, so I came up with this scenario instead. All of the items I can always use! I realized before I checked out that I didn’t need the Kleenex to get my total to $28 but I had to rush with the hubby and little one in tow. Used 27.98 ECBS! and spent $4.26 OOP. Got back $10 ECBS! It really depends on how you think about the cost. Do you consider the ECBS as cash like I do or do you consider them as coupons – only when you spend them? I confirmed that I am correct on my cost using Erica’s method on iheartcvs.com. Even though her spreadsheet says I saved 49% using coupons and ECBs. Not bad! That doesn’t consider the regular price of the item but the sales price and using coupons only. I’m trying to figure out if I consider them coupons instead, that would mean my cost is really $4.26 and I have $10 ECBs to use next time? Of course! I really like looking at my year today spending for 2009 which between 2 cards (yes, I use two cards) is about $1800! I’ve spent probably $150 I think OOP for the whole year and most of that was gift cards. Amazing! That is 92% savings! However, I know my savings is probably less then that because in reality I would never spend “regular” price for so many of the items that CVS offers instead I would shop at Walmart or Sam’s Club or Aldi and buy generic. Plus, as we both know we buy some items at CVS “free” after ECBs just so we can roll them over. I LOVE rolling my ECBs that is what I was trying to do here and I only rolled over $10. I also consider ECB’s as coupons, because I normally only use them to buy items that earn back more ECB’s and are little to nothing out-of-pocket. I stock up on toothpaste, shampoo, conditioner, etc. when items are free after ECB’s. I love rolling my ECB’s! Have you ever looked at the bottom of your receipt to see your year-to-date spending and year-to-date savings? My savings is ridiculously high and my spending is pretty low. I love CVS-ing! 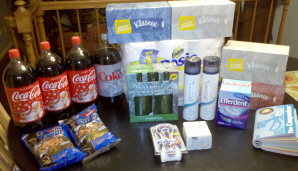 .-= Laura – Frugal Friends in Northern Virginia´s last blog ..2010 Savings Challenge =-. I consider them like coupons..otherwise I would get too confused I think. .-= Lucky´s last blog ..What I Did This Week To Save Money =-. lol I know what you mean! That’s why I’m confused right about my ‘cost’ being $22! Even though my out of pocket is so little. I’ve been following iheartcvs’s spreadsheet to track my cvs purchases and that is how Erica has been tracking it but I’m not sure if that is the best method.